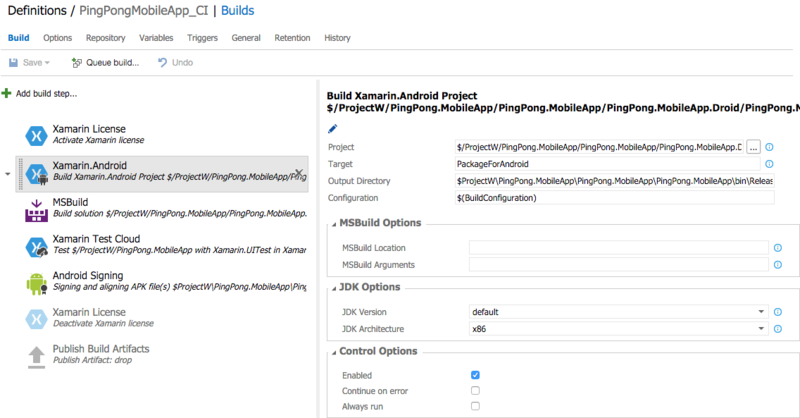 I'm setting up a CI build with VSO for my Xamarin.Forms (Android) app but I have a lot of error. I would appreciate if someone tell me how I can configure xamarin.Android build step. what should I address in the project field? should I give project sln or in the .Droid folder .csproj ? I could not find any document about this configuration. @PranavKandula You need to have a step where you activate your license as the first one, and then one where you at the end deactivate your license. Note you might not be able to activate the license if you have the license in use local at the same time. When I select sln file I have this error " Error MSB4057: The target "PackageForAndroid" does not exist in the project." I am running into the same issue. Can anyone help? The build doesn't complain about Xamarin License. Does it need one? Although I am a licensed Xamarin user, does VSO need to know that explicitly? You need to point your build step to the project file instead of the solution file.